New Jersey gets abused by comedians as being some sort of dump, but there are some scenic parts of the state. So it actually can be a nice place to live. That being said, it’s not a good place to die. Here’s a chart from the American Family Business Foundation that was featured in a recent Wall Street Journal editorial. Here’s some free financial advice: Don’t die in New Jersey any time soon. If you have more than $675,000 to your name and you die in the Garden State, about 54% may go to the IRS and the tax collectors in Trenton. Better not take your last breath in Maryland either. The tax penalty for dying there is half of a lifetime’s savings. That’s the combined tab from the new federal estate tax rate of 35% and Maryland’s inheritance and death taxes. Maybe they should rename it the Not-So-Free State. …Family business owners, ranchers, farmers and wealthy retirees can avoid that tax by relocating to Arizona, Florida, Georgia, Idaho, South Carolina and other states that don’t impose inheritance taxes. There are plenty of attractive places to go. 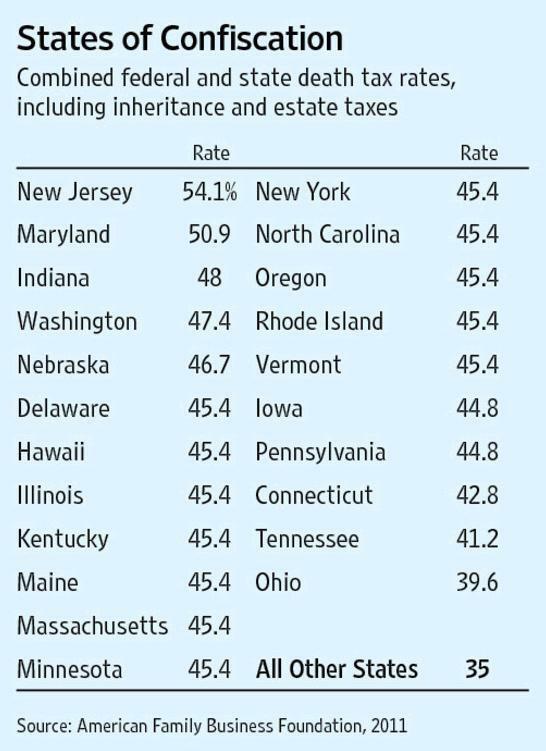 New research indicates that high state death taxes may be financially self-defeating. A 2011 study by the Ocean State Policy Research Institute, a think tank in Rhode Island, examined Census Bureau migration data and discovered that “from 1995 to 2007 Rhode Island collected $341.3 million from the estate tax while it lost $540 million in other taxes due to out-migration.” Not all of those people left because of taxes, but the study found evidence that “the most significant driver of out-migration is the estate tax.” After Florida eliminated its estate tax in 2004, there was a significant acceleration of exiles from Rhode Island to Florida. At the risk of stating the obvious, the correct death tax rate is zero, as I’ve explained for USA Today. Indeed, I also cited evidence from Australia and the United States about how people will take extraordinary steps to avoid this wretched form of double taxation. New Jersey has lots of problems. All of those problems will be easier to fix if successful people don’t leave the state. Sounds like another issue for Governor Christie to address. This was such an absurd display of mendacity that even the left-leaning PolitiFact people had no choice but to conclude that Obama’s statement was false. I suppose I could take a mature approach to this controversy and explain in mind-numbing detail why the President was wrong, but that wouldn’t be much fun. I’d much rather copy the guy who did the famous QE2 video and have some fun. This is my first experiment with a cartoon video, so I welcome feedback.